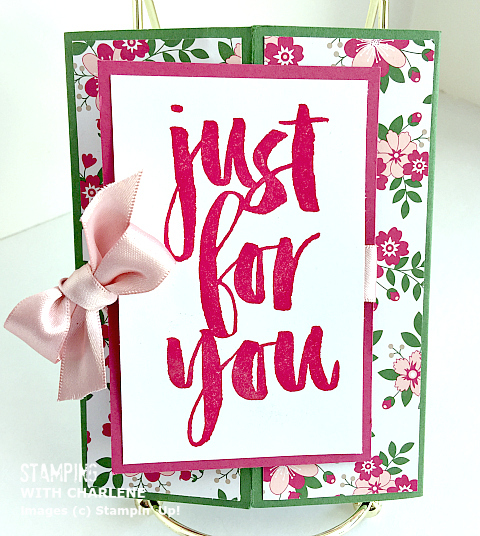 The “Just for You” saying is from the Botanicals for You stamp set from the current 2016 Sale-a-Bration promotion catalog. Take a closer look at the Blushing Bride satin bow. The Blushing Bride ribbon is part of the Love Blossoms Embellishment Kit. 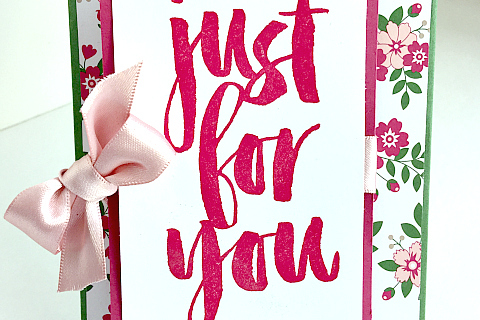 I think the bow is the embellishment that makes this card so stunning. The card doesn’t use any fancy technique or over-the-top styling; it’s just paper, ribbon, one stamp, and Rose Red ink. However, the result is really breathtakingly beautiful. I’m usually heavy on the embellishments when I make a card, but it was a fun break to make an easy card that allows the paper and the ribbon to do all the work.